Things are heating up at the Idaho Statehouse as the deadline for bills comes to a close. It’s time to get down to business about topics such as climate change, renewable energies and clean water! For the first time, an Idaho governor attended the annual event to mark the anniversary of the Bear River Massacre. One hundred and fifty six years ago, members of the U.S. Cavalry killed hundreds of men, women and children of the Northwestern Band of the Shoshone Nation along the banks of the Bear River in Southeast Idaho. As Gov. Little said, “How we honor the past is a good predictor of how we will prepare for the future.” ICL has partnered with tribal nations for years on efforts to restore and protect wildlife, waters and the places they call home. We look forward to building our relationships with Idaho’s Native American leaders and tribes to advance common goals including working to restore the Snake River, the Blackfoot River and Lake Coeur d’Alene; restoring salmon and steelhead runs to their potential; and protecting access to public lands. As previously reported, Gov. Little recognized the reality of climate changeand the fact that we need to do something to address its root causes. There’s been little to no blowback from legislators, who in the past noted they received their climate information from Rush Limbaugh. With meager snowpack in the mountains, there’s potential for significant impacts from climate change in Idaho in 2019. 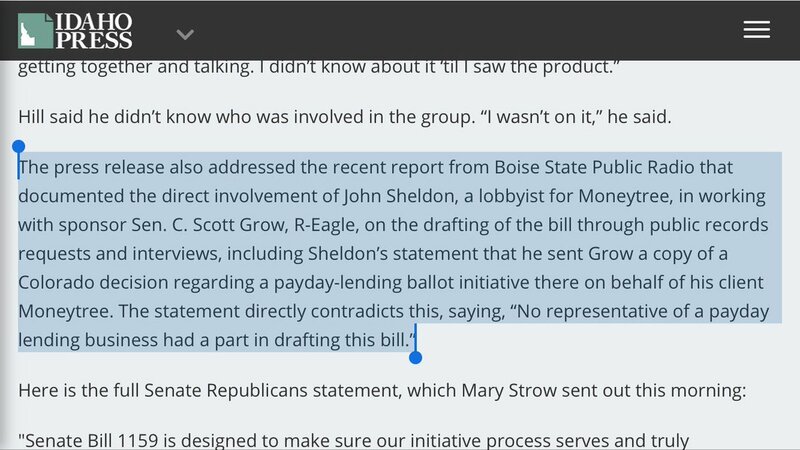 Still, the Idaho Legislature has never hosted a formal hearing on the topic. While we partnered with legislators in 2017 to host an informal hearing in the Capitol, no committees have ever considered the topic. There are rumors this might be changing … fingers crossed! Continuing the theme of climate, a bill that would limit the ability of homeowners associations (HOA) to restrict solar panels was introduced in the House Business Committee this week by Rep. Ilana Rubel (D-Boise). Solar installers have run into restrictions with some HOAs. Increasing renewable energy production requires removing obstacles for homeowners to harvest the sunshine hitting their roofs. In related news, we’re partnering with Idaho utilities, vehicle manufacturers and others as part of an EV coalition to host an EV day at the Capitol on Valentine’s Day. Transportation is one of the biggest contributors of air pollution and greenhouse gases in Idaho. Coupled with the fact that Idaho imports 100 percent of our gasoline and diesel, we export nearly $3 billion from our pocketbooks annually, even though our vehicles could run on Idaho-grown renewable power. Think about the impact of keeping $3 billion in the borders of Idaho! Mark your calendars for Thursday, Feb. 14 at 1:30 p.m. More information to come! For years, ICL has been concerned about water quality in the mid and upper Snake River (above Brownlee Reservoir). Outbreaks of toxic algae and fish consumption warnings have become the new normal. Phosphorus and nitrogen levels in the water are beyond Clean Water Act thresholds and we’re paying the price, including contaminated drinking water. There are numerous contamination sources, but water from irrigated fields flowing back into the river and millions of pounds of dairy waste are two of the biggest culprits. Wastewater from communities and other industries also contribute their share of pollution. The good news? There are efforts afoot to address water quality in the Snake River and next week the Southern Idaho Water Quality Coalition will be presenting in the House Resources Committee on Tuesday, Feb. 5 at 1:30 p.m. If you care about clean water and agree that the Snake River should be swimmable and fishable again, we encourage you to tune in (even if you’re not in Boise)! Last, but Not Least, the Tie of the Week! While much of the nation suffers under record-setting cold, I saw my first butterfly of the year at the Statehouse this week as well as my first earthworm. My bet is that crocuses will be popping in your lawn this year, earlier than last. Let me know how you’re seeing the reality of climate change.